Based on a story by Stephen King, Spike’s THE MIST centers around a small town family that is torn apart by a brutal crime. As they deal with the fallout an eerie mist rolls in, suddenly cutting them off from the rest of the world and, in some cases, each other. Family, friends and adversaries become strange bedfellows, battling the mysterious mist and its threats, fighting to maintain morality and sanity as the rules of society break down. THE MIST stars Morgan Spector, Alyssa Sutherland, Gus Birney, Danica Curcic, Okezie Morro, Luke Cosgrove, Darren Pettie, Russell Posner, Dan Butler, Isiah Washington, Jr. and Frances Conroy. You can find a rundown of who the cast is playing right here if interested. The Mist will premiere on Spike on June 22nd. Fear. Human. Nature. 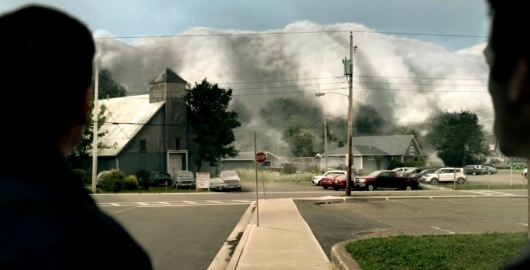 “The Mist,” from a story by Stephen King, premieres Thursday, June 22nd on Spike.